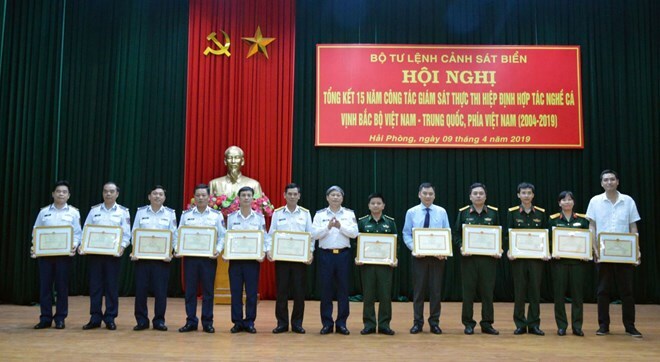 Hai Phong (VNA) - The Vietnam Coast Guard (VCG) has well performed its task as a liaison agency between Vietnam and China in monitoring the implementation of the countries’s agreement on fishery cooperation in the Tonkin Gulf. It was noted at a conference reviewing the supervision of the implementation of the Vietnam-China agreement on fishery cooperation in the Tonkin Gulf held in the northern port city of Hai Phong on April 9. Speaking at the event, Tran Van Nam, head of the legal and profession department at the VCG, said the coast guard force has soundly implemented international cooperation, and proactively worked with the Chinese side to devise plans for fishery patrol activities. As the coordinating agency in supervising the enforcement of the pact, the VCG worked with the naval and border and fishery forces, pushing ahead with enforcement by various methods. The forces strictly abided by policies of Vietnamese Party and State and laws, and the regulations of the agreement, Nam said. According to Nam, fishery activities of Vietnamese and Chinese fishermen have step by step stabilized, contributing to increasing Vietnamese and Chinese fishermen’s awareness of abiding by laws, the friendship between the two countries, as well as economic benefits brought by the agreement. Such activities have also contributed to stabilizing order and security, and firmly safeguarding Vietnam’s sovereignty over islands and seas in the gulf, he said. Since 2006, Vietnam and China have conducted 16 joint fishery patrols in the gulf, released young fish into the gulf to protect aquatic resources, held search and rescue drills, exchanged professional skills in maritime law enforcement, and run exchange programmes for young offices. As many as 237 Vietnamese fishing ships have helped supervise the enforcement of the pact, detecting 13,387 violations by Chinese fishing ships.